I first noticed bib necklaces a few months ago when I was browsing at my new favourite jewelry store with HG. But then we quickly glanced over it thinking that a) how will we wear it?? and b) even if we figure out how to wear it, where will we wear something so fancy to? It didn’t enter my mind again until recently, when my mom commented on how boring one of my outfits looked, and I was promptly reminded of the power of accessorizing and a statement piece. Then of course, I saw B wearing a bib necklace this week, and knew that I simply must get one! The bib necklace is so perfect for her outfit that it actually looks part of the dress. And the beauty of the bib necklace is that, unlike a decorated collar of a dress/shirt, you can move it onto a different outfit and get a whole new look from it! The trick is to keep the rest of the outfit simple. By no means do you have to wear all black, but do try to keep the upper body bold and clean. Stay away from prints and details like ruffles. I’m loving these three from Shopbop. And look, the pictures above even show you three additional ways of wearing a bib necklace: a) with a simple wide neck tee for a casual look b) strapless dress for an evening look and c) with a simply designed flashy top for going out! As usual, Forever 21 offers cheaper versions in the form of these pearl bib necklaces. The black one (left) would go well for both casual and evening. I’m not sure sure about the white (right) one though. It is a bit too wide and you might look like you are actually wearing a bib. 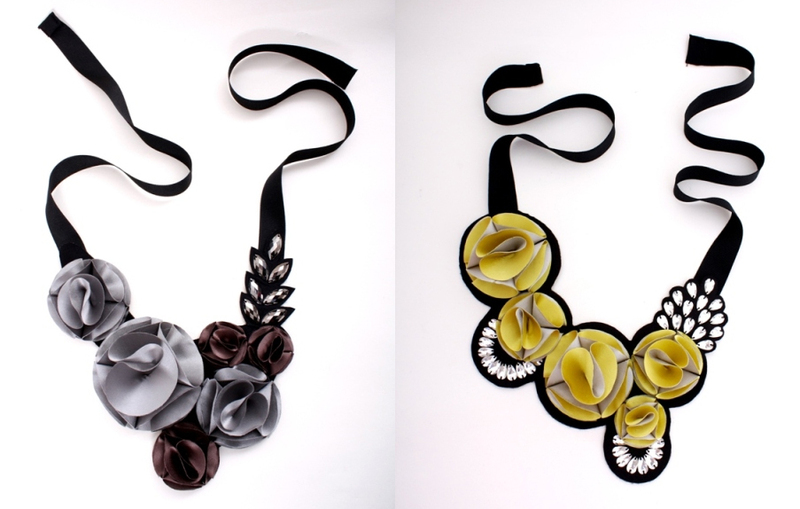 And I simply had to post these two bib necklaces from Ibrah. I love the vibrant colors and the unique designs. It gives off a bit of a Marni vibe! I found it on the blog of a fellow blog reader from Kuwait, and it has stuck in my mind since. I think it will be a great accessory to spice up a casual tee or a dress. It is a Kuwait label known for its handmade accessories. I must go back to my jewelry store soon. Hopefully they will have something jeweled, edgy and not black! I loved this one on B. And I think S was wearing a nice one in the episode before! I really love B’s style! Like it very, very much!!! Hi, I love your idea’s on bib necklaces, there are a lot out there that are just too full on but these are beautiful(and i agree on the white pearl one… pretty out there!. I’m new to Blogging and just started a fashion, beauty, health and life ‘musings’ blog thats not fully completed but i’d love if you could give me some tips? I’ve only started on fashion so far..